Uncover the mysteries beneath this ancient ruin. Meet Tolfdir and the trainees outside Saarthal. Follow Tolfdir into the ruins. Find Arniel Gane and help him find some artifacts. Use the Saarthal Amulet to escape the trap. Follow Tolfdir deeper into the ruins. Discover the danger within Saarthal. Talk to the Arch-Mage and receive your reward. This quest automatically starts at the end of First Lessons, when Tolfdir suggests that visiting the ruins of Saarthal would be an excellent opportunity to learn more about the "various applications of magic throughout history". Saarthal's location is added to your map (if you have not yet discovered it yourself), and Tolfdir and the other College of Winterhold students will start travelling there. They walk the entire distance, meaning that it is easily possible to travel to Saarthal more quickly than any of your companions. It takes them at least four in-game hours to make the trip, longer if they have to deal with multiple enemies (however, all of the students are given protected status at the start of the quest, meaning they are not at risk of being killed along the way). If you are trying to find them en route, they walk from the College into the town of Winterhold, then turn onto a path that leads west from behind the Jarl's Longhouse. You may find it convenient to do another quest in between First Lessons and Under Saarthal, instead of waiting at the ruins for Tolfdir to show up. When Tolfdir arrives at Saarthal, you can advance the quest by selecting the dialogue option, "I'm ready. Let's go." At that point, the door to Saarthal unlocks and you can enter. You can select the "I'm ready" dialogue before Tolfdir actually gets all the way to the entrance — the dialogue option becomes available at the top of the stairs leading down into the excavation pit (at the same point where you are first told that you have discovered Saarthal). You do not need to wait for the other students before proceeding with the quest; any missing students will appear as soon as you enter Saarthal. If you choose to delay before proceeding with this quest, Tolfdir and the students will stand around outside Saarthal, indefinitely. Tolfdir will still offer services, including selling Alteration spell books, without triggering the quest. This article focuses on the Under Saarthal quest, specifically how to complete all the quest objectives. For information about the dungeon itself, including locations of all loot, see Saarthal. We're particularly interested in the prevalence of magical seals placed on the tombs here. It's rather unlike anything we've encountered. In spite of Tolfdir's repeated warnings about safety, there are no enemies in the first rooms of the excavation. Each of your fellow students has a different reaction to Saarthal. Onmund is the least happy of the three, repeatedly complaining about being in the burial site of his ancestors: "There's no chance anyone in authority approved this. Our ancestors should be allowed to rest in peace." His concerns have evoked some sympathy from Brelyna, who comments, "To think, my ancestors destroyed the homes of Onmund's ancestors. So much bloodshed." As usual, J'zargo is only interested in how he might be able to profit from the expedition, "Do you think there's treasure here? Something to make J'zargo a powerful wizard?" Ah, yes. Hmm. Well, why don't you see if you can assist Arniel Gane? He's one of our scholars, here working on cataloging our finds. I expect he'd appreciate some help in locating any additional magical artifacts here in the ruins. Any enchanted items will do; the usefulness of the enchantment is irrelevant. If you find anything, the class can look it over. For Brelyna: Brelyna, my dear, why don't you search for warding magics. Anything designed to keep people out. Don't interact with them, just identify them. Her subsequent response: I'm not seeing signs of any warding magics at all. Either they're not here, or they were removed long ago. For Onmund: Onmund, please search that area over there. See if you notice any... residual energies. Alive or undead. His subsequent response: I wonder if everyone else would be so happy to rifle through the bones of their ancestors. For J'zargo: J'zargo... what shall we have you do... Ah! Why don't you verify that we're the first ones here? Look for any amount of tampering with the tombs. His subsequent response: J'zargo finds nothing but dust in these ruins. Ah, yes. You. I remember you. You're going to help? That's fine. Just... Just don't make a mess of my work. I've only looked through a portion of this section. You, uh, you can look around in the chambers just north of here. Try and be careful, all right? We don't want to damage anything. Although talking to Arniel doesn't give you much new information about your assignment, it does update your quest objective and, even more importantly, adds quest objective markers to each of the four items: three Enchanted Rings and one "Ancient Amulet". Finding the three rings is entirely optional and has no effect on the outcome of the quest. They are lying on the floor at three locations in the nearby passageways. Although the rings can be obtained without talking to Arniel, finding the small items without quest markers is very challenging. If you do find one of them on the floor before talking to Arniel, the quest will update and you will have markers for the other two. It is also easier to collect the rings before picking up the Ancient Amulet rather than after — once you have the amulet, your quest objectives update and you lose the quest markers pointing to the rings. At any point after finding the Ancient Amulet, you can return to Arniel Gane and give him any Enchanted Rings that you have found. He takes all the rings from you, but he is more concerned with the mess you have made than with the new artifacts, and does not give you any reward (not even a boost to his disposition). Therefore, you may prefer to instead keep the rings with their +20 Fortify Health enchantment for yourself; they are not quest items and can be freely sold, given to a follower, or disenchanted. Or if you really want to cover all bases, you can pick up just one ring, give it to Arniel, and then pick up the other two, and keep them (Arniel won't even recognize any additional rings after you give him the first one). The only artifact that must be found to advance the quest is the Ancient Amulet. It can be found at the northern-most end of the passageways, suspended in front of a brightly-lit, arched section of the wall. You can actually pick up the Amulet at any point (before even getting the assignment from Tolfdir) if you are in a rush to advance the quest. As soon as you pick up the Amulet, a spear trap activates behind you, locking you into the small space. If Tolfdir is nearby he will suggest that you try using the amulet. In your inventory, it is listed as the Saarthal Amulet (under Apparel), and has an enchantment that reduces spell costs by 3%. More importantly, equipping the amulet will trigger a visible resonance effect in the wall where you found it, causing Tolfdir to suggest "I wonder... what effect might your spells have?" This is your hint: casting any targeted spell or shout at the wall while wearing the amulet collapses the wall. The Flames spell given to all players at the start of the game is one possible spell, but any spell or shout cast at a target will work. Collapsing the wall also lowers the barrier behind you, allowing Tolfdir to rush forward. Hold, mage, and listen well... Know that you have set in motion a chain of events that cannot be stopped. Judgment has not been passed, as you had no way of knowing. Judgment will be passed on your actions to come, and how you deal with the dangers ahead of you. This warning is passed to you because the Psijic Order believes in you. You, mage, and you alone, have the potential to prevent disaster. Take great care, and know that the Order is watching. The Psijic Order? Are you quite sure about that? That's very odd. And danger ahead? Why that doesn't make any sense at all. The Psijics have no connection to these ruins. And no one's seen any of their order in a long time. I have no idea, but it's fascinating. Assuming it's true, of course. The Isle of Artaeum disappeared over a hundred years ago, and no one has seen them since. And yet now, suddenly, they have chosen to contact you? Why, it's intriguing! If nothing else, I'd take it as a compliment. The Psijics have only ever dealt with those they feel worthy. Tolfdir finishes up by suggesting that the coffins in the room should be searched. Predictably, the coffins contain two leveled draugr, who jump out and attack on Tolfdir's cue. However, the draugr also uncover the way forward, through the back of one of the coffins. From this point until the end of the dungeon, Saarthal is a typical Nordic ruin, containing leveled draugr enemies. There is a rotating pillar puzzle in one room; the symbol to match is above and behind each pillar. A second such puzzle is more complicated; each of four pillars will turn from zero to three of the other pillars, and should thus be rotated in descending order of the number of pillars they turn. Condemned by your crimes against realm and lord. And the charm which you bear be sealed by our ward." Well now... would you look at that. I never imagined we'd find something like this. Why is this buried so far within Saarthal? 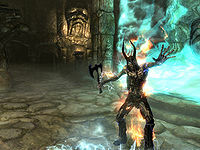 However, he is unable to fully investigate, because approaching the orb attracts the attention of Jyrik Gauldurson, a unique and powerful draugr who has been trapped in Saarthal for eons. Your initial attempts to damage Jyrik will inevitably fail, because he is drawing energy from the orb to make himself invincible. 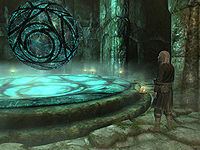 Once Tolfdir realizes what is happening he rushes down to the orb and works on severing the connection between Jyrik and the orb. After four seconds, Tolfdir starts to cast a lightning-like spell at the barrier surrounding the orb, which succeeds in making Jyrik vulnerable. Tolfdir spends the rest of the battle maintaining his spell, leaving you to take care of actually attacking Jyrik. Jyrik is still a challenging enemy, in part because of a rotating elemental shield. 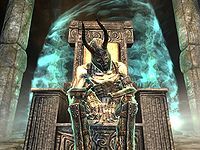 Once you have killed him, be sure to loot his corpse for the Gauldur Amulet Fragment and Writ of Sealing, both of which are necessary for the Forbidden Legend quest; if you had not previously started this quest, reading the writ or taking the amulet fragment will trigger it. The Staff of Jyrik Gauldurson can also be found nearby. I have no idea! This is amazing. Absolutely amazing. The Arch-Mage needs to be informed immediately. He needs to see this for himself. I don't dare leave this unattended. Can you return to the College and inform Savos Aren of this discovery? Please, hurry. Let him know that we've unearthed something... Well, I'm not sure. Something unique, let's say. It's clearly magical in nature, but like nothing I've ever seen before. He should be most interested. Take advantage of the door behind the orb to discover a shortcut back to the entrance of Saarthal — and don't miss the Ice Form Word Wall and boss chest along the way. Please don't tell me that another one of the apprentices has been incinerated. I have enough to deal with right now. You can choose between two followup responses, either "We've found something in Saarthal, and Tolfdir thinks it's important." or "We found some sort of... orb. Tolfdir wanted you to see it." Both have the same ultimate result, although Savos seems somewhat underimpressed by the latter response. In the end, he thanks you and rewards you with a Staff of Magelight (suggesting that it may come in handy if you explore any more Nordic Ruins). He also tells you to check with Urag gro-Shub for any possible leads regarding the nature of the artifact, initiating the Hitting the Books quest. Completing this quest also has several advantageous effects. Your rank in the College of Winterhold is increased from Student (rank 0) to Apprentice (rank 1), and your disposition with Tolfdir is increased. 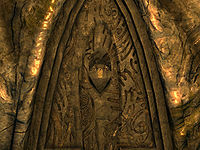 Multiple radiant quests related to the College of Winterhold are also enabled once Under Saarthal is complete, namely Brelyna's Practice, J'zargo's Experiment, and Onmund's Request. If you wish to start any of these quests right away, rush back to Saarthal and catch any of the four quest-givers as they start their slow walk back to the College of Winterhold. If it is night, after sleeping in your bed for one hour, they will appear in the Hall of Attainment. Otherwise, they can eventually be found around the college. Tolfdir's radiant quest, Tolfdir the Absent-Minded is also triggered by the completion of Under Saarthal, however, to start that quest Tolfdir must also be located in the College. Since Tolfdir stays in Saarthal to continue watching over the orb, his quest can only be started when Hitting the Books is nearly complete (Tolfdir returns when, behind the scenes, the orb itself is moved to the college). Tolfdir's dialogue topic leading you back to Savos Aren is bound to the death of Jyrik Gauldurson. If you raise Jyrik's corpse before speaking to Tolfdir, you will not be able to continue the quest until the effect wears off. They're a very old order. Pre-dated the Imperial Mages Guild by quite a bit. In fact, the Mages Guild was founded in opposition to the idea of the Psijic Order, that only an elite few should have control over magic. No one has seen or heard from them in over a hundred years now, though. Ancano learns that something was discovered in Saarthal, and subsequently tracks you down and interrogates you. If you have gone directly down the stairs to The Arcanaeum and spoken with Urag gro-Shub, Ancano will stop you there. Otherwise, Faralda warns you about the impending interrogation, and is concerned that you "mind what you tell him". (Speaking to her after Ancano has an incongruous dialog entry.) When Ancano questions you, you don't have an opportunity to tell him anything — in fact, he does more talking than you do. Something was discovered in Saarthal that was significant enough that Tolfdir sent a new member of the College, alone, to deliver word. That sounds precisely like the sort of thing that should matter to everyone. Especially me. This is a prerequisite quest for completing Forbidden Legend as one of the three Gauldur Amulet fragments is located in Saarthal, and this quest is the only way to unlock Saarthal. Although all three students are supposed to walk to Saarthal at the start of this quest, they may not all actually make the trip. However, this does not have any effect on the quest. Once you enter Saarthal with Tolfdir, the students will appear there with you. Occasionally, Tolfdir may not show up at all and the quest will be stuck because he cannot unlock Saarthal. This may be triggered by Tolfdir fighting an animal nearby and remaining at that position. Use the console command prid 0001C1A1 followed by moveto player to solve this issue. Sometimes, when you're about to fight Jyrik Gauldurson, Tolfdir won't make a remark on the orb and thus the quest won't update, but Jyrik Gauldurson will still attack. This can be resolved by leaving and entering again and he will be fighting some draugr. Sometimes, when the vision of Nerien appears, Tolfdir will slide to the right into the wall and will not follow you. ? Sometimes, when the vision of Nerien appears, he remains silent. Activation attemps yield the message "This person is busy". You can save, shutdown game and console/PC, restart and reload savegame. Nerien speech follows. Take care to save again as combat follows and if you die you'll have to cold restart again. Other sources say you can exit room just before Nerien is about to appear, exit ruines to Skyrim open field, and reenter. Both ways seem to init some game variable posibly related to this bug. ? Tolfdir may pick up the Staff of Jyrik Gauldurson during combat—to get it back you will have to buy it from him. The gate may not open when you collapse the wall after taking the Saarthal Amulet, which makes it impossible to finish the quest. ? 200 Finishes quest I've delivered word to the Arch-Mage that something interesting was found deep within Saarthal. The following empty quest stages were omitted from the table: 11. On the PC, it is possible to use the console to advance through the quest by entering setstage MG02 stage, where stage is the number of the stage you wish to complete. It is not possible to un-complete (i.e. go back) quest stages, but it is possible to clear all stages of the quest using resetquest MG02. This page was last modified on 27 August 2018, at 20:37.